Trash, recycling and yard waste are collected every Tuesday, unless it’s a holiday week. You can check the pick up schedule below. Return plastic grocery bags to grocery stores — do not put them in curbside recycling. Check the list of recyclable materials below for other items we can’t collect. The City of Hilliard wants to make proper recycling as easy as possible for you so we provide each resident with recycling containers to place acceptable items in for recycling. Please place these containers at the curb on your recycling day under the same guidelines as your trash. If your recycling container becomes damaged or if you need an additional container, please call (614) 876-7361. By only recycling materials that are accepted at the recycling facility, your recycling will make more of an impact. 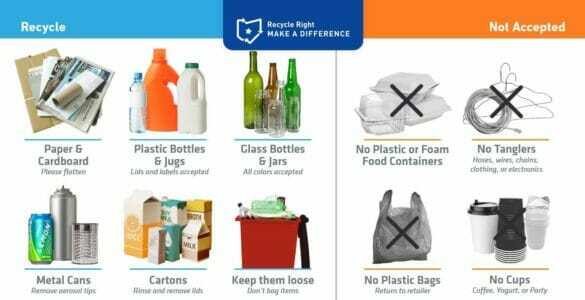 SWACO’s “RECYCLE RIGHT” campaign makes proper recycling easy by giving you a comprehensive list of what should and what shouldn’t go in your recycling container. For more information about “RECYCLE RIGHT,” please visit here. Have a question about what’s accepted or not accepted for recycling? Visit SWACO’s Frequently Asked Questions page here. To learn more about what is acceptable in your trash, and how to properly dispose of or recycle items that do not belong in the trash, please visit SWACO’s website at www.swaco.org and click on the “Diversion” tab. 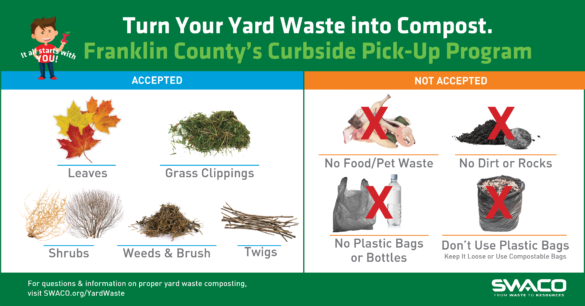 Yard waste should be placed at the curb on your normal yard waste collection day and should be cut into lengths less than 4 feet. Weekly chipper service occurs April through October from Monday through Thursday, weather permitting. To utilize the chipper service, residents should place their tree limbs and shrub clippings at the curb by 7 a.m. on the scheduled day of service. Trimmings must be at least 4 feet long. Piles should not include vines, thorns, roots, grass of any kind, and foreign materials such as metal, lumber, nails, wire, string, rope, or staples. When a tree service or landscape company is hired to cut down trees or clear areas, they are solely responsible for that removal.